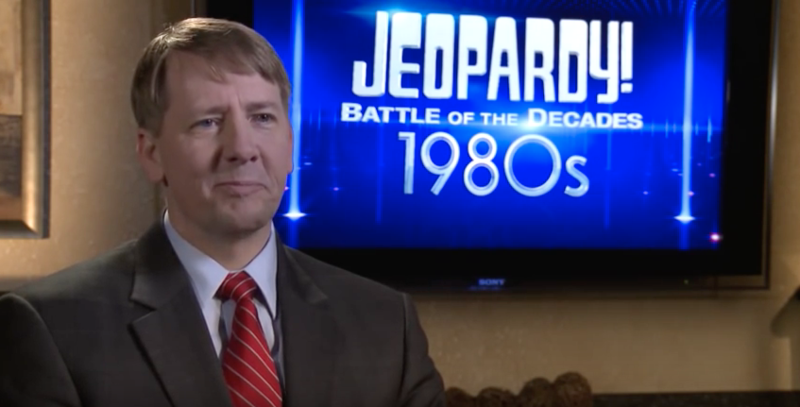 Rich Cordray, a democrat currently vying for Ohio's governorship, was a five-time 'Jeopardy!' champion in the 1980s and recounted his winnings in a 2014 video for the show. Politics is supposed to be fun, right? Uh, yes, right. Well, maybe "fun" isn't the best description. You can answer a couple of Jeopardy!-type questions, right? After all, Rich Cordray, the Democratic candidate for Ohio governor, was a five-time Jeopardy! champion and a Tournament of Champions semi-finalist back in the 1980s. So, you can, no doubt, answer a couple. Answer: Having a ballot issue on the November ballot to repeal a Democratic-sponsored increase in the Hamilton County sales tax. Question: What makes Hamilton County Democratic Party activists very uneasy? Question: What makes Republican party leaders – and particularly their candidates – giddy with delight? Easy as pie, isn't it? Doesn't take an incredibly high IQ to figure it out, does it? The Hamilton County Republican Party – along with their allies in COAST, a long-standing anti-tax organization – figured it out right quick when, about a month ago, the two Democratic county commissioners, Todd Portune and Denise Driehaus voted to put on an additional 0.2 percent increase in the sales tax to deal with a looming $28 million shortfall in the county budget. Hamilton County Commissioner Chris Monzel (left), with Portune and Driehaus, lays out his opposition to the sales tax hike. COAST got the ball rolling on a petition initiative to collect petitions with the signatures of 23,629 registered voters to place a repeal of the sales tax on the November ballot. 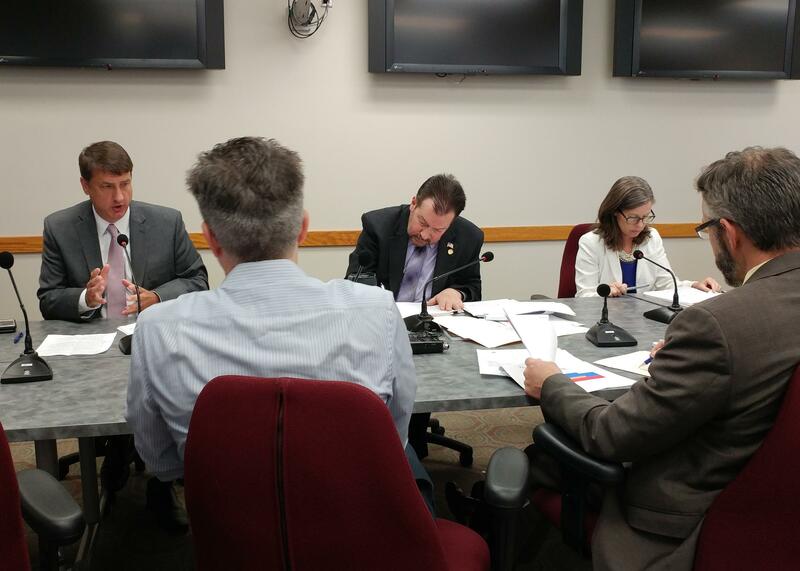 At Wednesday's Hamilton County commission meeting, Portune said Republican county commissioner Chris Monzel told him the group gathered about 38,000 signatures. The Hamilton County GOP jumped on board the effort, even raising money to hire a professional signature-gathering firm to help with the effort. It was a daunting task from the start. The anti-tax folks had until July 18 to turn in the petitions to the Hamilton County Auditor. That, of course, would be today. "It's a high bar that has been set for us,'' Matt Wahlert, a North College Hill council member who has been organizing hundreds of volunteers to collect signatures, said earlier this week. "I'm a little concerned that if I say I am optimistic that we are going to have enough, because I'm afraid people are going to see that and say, 'well, they don't need my petitions,''' Wahlert said. The petitions are being gathered together by several individuals and at the Hamilton County Republican headquarters downtown. Sometime today, the leaders of the effort will march over to Hamilton County Auditor Dusty Rhodes' office and formally deliver them. The petitions will stay in the auditor's office for 10 days, where they will be open to public inspection. And you can bet they will be inspected. Initiative petitions are not just a matter of checking names. There are a lot of technical provisions in the law about filling out the forms and if any of them are not followed, the petition could be thrown out. After 10 days, the petitions go to the board of elections, where the board staff has 10 days to check the names to see if there are 23,629 registered voters who have signed. If there are enough valid signatures the petitions go back to the auditor, who has until Aug. 8 to certify the issue for the November ballot. Except for the fact that the people running the petition drive must make sure that all of the petitions are submitted at the same time today. "If you are a circulator, you can't just wander into the auditor's office and try to file,'' Wahlert said. "And if you went to the board of elections, they'd tell you they don't accept them." But, to get back to the crux of the matter, why are we going through this? The people who made it necessary for the Democratic county commissioners, Driehaus said, are the Republicans in Columbus – Gov. John Kasich and the GOP legislature – who, some years ago, took away much of the Local Government Fund and left villages, townships, cities and counties scrambling to make up the difference or cut their services to the bone. "The state cuts killed us,'' Driehaus said. "This organization is so lean now that if this ballot issue were to pass, we'd be cutting to the bone. "Honestly, the last thing I want to do as an elected official is vote to raise taxes,'' Driehaus said. Mack Mariani, associate professor of political science at Xavier University, said that had to be a tough vote for Driehaus in particular. "This was a hard vote, because I think it is likely that she probably has some further political ambitions,'' Mariani said. Mariani said he thinks it is an "entirely plausible explanation" to look at this effort, run by the Republicans, to get this anti-tax issue on the ballot to drive up the conservative turnout, particularly in western Hamilton County. "One thing is certain – every candidate for every office running in this county is going to be asked about this, whether it has anything to do with his or her office in the first place,'' Mariani said. Democrat Aftab Purevel, the county clerk of courts who is taking on veteran GOP congressman Steve Chabot, will certainly be asked, Mariani said. "And this has nothing to do whatsoever with a congressional race,'' he added. Speaking of Chabot, the organization that has been running the nuts-and-bolts of the petition campaign, The Fountain Square Group, is a conservative Republican consulting firm that has close ties to Chabot. Jamie Schwartz, president of The Fountain Square Group, has managed a number of Chabot's congressional campaigns, and others with the organization are close to Chabot. The Fountain Square Group also has Republican Nancy Aichholz as a client. Aichholz is running against Rhodes for county auditor and has had a high profile in the petition drive. We don't know if they will have enough valid signatures to make the ballot. Frankly, neither do the organizers. But we can guarantee that people like Chabot, Aichholz and GOP county commissioner Chris Monzel are keeping their fingers and toes crossed that there are enough.